Since Valentine's Day was this past week, I feel a romance themed post is appropriate. I had a very nice Valentine's Day, I spent it with my boy-pup Chazz! We went to 2 pawties on Twitter, and he sent me a card and pressie in the mail!! A pretty squeaky stuffie! I love to play with squeakies!! It is pink with white hearts on it and bone shaped. It matches my blankie pawfectly! Even the envelope matches! Now I'd like to welcome my boy-pup Chazz as my first guest blogger! First I would like to thank the ladies over at PepperPaws for allowing me to be their very first Guest Blogger. I will tell all you dear readers, from the start of this post, I am Pepper's special Boy Pup. We are a couple. We go lots of places together, but we both have our own lives too. Some of our pals on Twitter tease us, and say we are such a cute couple. Well we are, I would have to say! See when we are next to each in piktures and stuff our fur blends together. We both have similar coloring. Pepper is reddish-blonde, and I am reddish-tan, so when we snuggle we blend!! So, this is the story of how I met PepperPomeranian, starting talking to her, okay flirting with her; and eventually asking if she wanted to go on a date. It turned out, we both had little crushes on one another; but Pepper didn't want to say anything in case I didn't like her too. I guess it starts with #NipClub. You're all familiar with that place, right? NipClub is the hippest, swingin', fun place on the internet for animal pals! All pals are welcome, every Thursday nite to dance, wiggle, have great food & drinks (alcoholic & non available). Conversations galore. Everyone is polite, sometimes up to mischief, ya never know what might happen. But no meanies allowed, ever! Sometimes there are games & quizzes, & presents are awarded. It's bunches of fun. Often I ride my motorchomper there. That's my motorcyle for you who may not unnerstand animal jargon. I am a member of the #BadBoysofTwitter, and you can look for us next time you stop by Twitter. And this is important part too. Each week there is a special charity that benefits. When you tip (donate) the barktenders or dj's for getting you food & drink and for playing cool music - you are actually donating to charity that has been vetted & approved by Nipclub management. It is a great way to spend some time on a “Fursday nite” with pals, and do something nice for an animal related charity/organization. Back to my story... I used to see Pepper every week, cuz she works a shift at the NipClub as a barktender. She makes really good drinkies, and does speshul garnishes on top to make drinks extra yummy. Well, I noticed her cuz she was fun, and talkative, and nice to everybuddy who she waited on at the bar. When her shift done, she go with galpals on the dance floor and wiggle and laff, and have great time. So after lots of Thursday nights watchin dis same behavior it didn't look like she had a boyfriend or anything. That surprized me cuz she is very cute. No, I mean she is cute in her liddle face, and her bright eyes kinda sparkle. So I asked her if she wanted to go on a date with me....and she said yes! Our first date was to Nipclub's Monster Ball. Pepper picked our costumes That's me on the left as Incubus, and Pepper is dressed as Succubus. 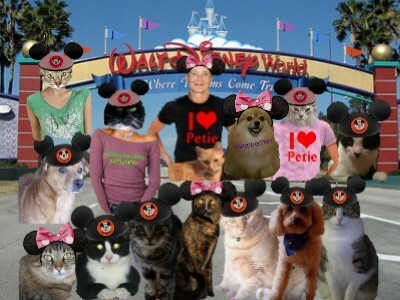 We had a very speshul evening put together for us by our furriend and Promoter of NipClub, KingTuttiFruiti. Dinner, private violin music at our table, special menu, drinks, the works. I think Pepper was impressed, ha ha I know I was. KTF took care of everything. Now here's the funny thing, the way the date ended. Pepper ended up in Twitmo. That is code for Twitter Jail. There was nothing I could do, and I was kind of upset. I spoke to Tutti – he smiled and handed me a key. He explained the key was for the cell next to Pepper's. I could go in there and lay on the floor and keep her company for the night. And that's just what we did. The next day I went home with her and I waited as she explained to her mommie that I had nothing to do with what happened, her going to jail. She told her Mommie I was gud boy pup & she liked me. This is what was strange to me. Pepper could probably have any boypup she wants , but she picked me. Hmn, maybe I never understand gurls, but I not complaining. I lubs Pepper, and we haf lots of fun, and do jokes, and run, and take walks in park, and even gonna go on picnic together. 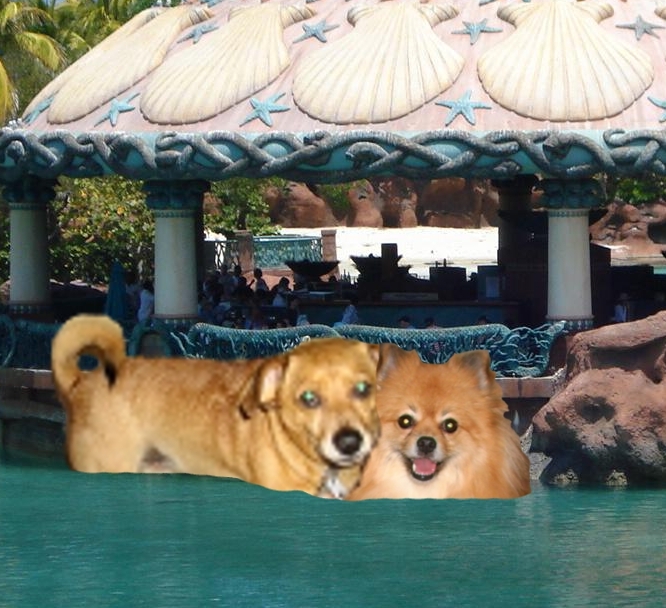 From that time, we went to other #Nipclub pawties and people started asking about us. So here some pictures I thot u might enjoy.. This one is kind of wild. 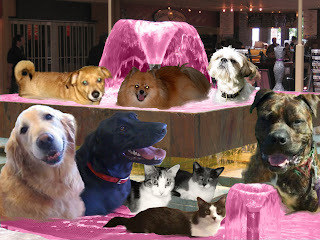 That's Pepper & I (upper center & upper left side) in Pink Champagne Fountian playing wif pals at #AnipalAcademyAwards afterpawty at #Nipclub. It was late and evrfurrybuddy was hafing a good time! This is us just a short time ago at Atlantis Island Pawty. As you see wif all the time that has past, and all the dates we've been on; we haf grown quite close. She my best friend after my Mommie ! Well, I guess that's it from me. Now you know da beginning of Pepper & ChazzTheDog. Now those really are ….Two Sweeties!! awwww your story is soooooooooooo romantic!!!! Wishing you many more days of bliss together! Awwww!!! Congdogulations Pepper! Chazz seems to be a really great pup. :D You two are so cute together! Thank you, Chazz tells it very well. Oh Dog! How romantic! A whirlwind romance AND a pawsome Valentine gift! Thank you, I do love squeaky toys!